On April 15, don't be surprised if the line at your local post office is a bit shorter than usual. That's because your neighbors may not be paying any income taxes this year. An astonishing 43.4 percent of Americans now pay zero or negative federal income taxes. The number of single or jointly-filing "taxpayers" - the word must be applied sparingly - who pay no taxes or receive government handouts has reached 65.6 million, out of a total of 151 million. Those numbers come from an analysis published yesterday by the Tax Policy Center, a joint project of the Urban Institute and Brookings Institution. Neither is a low-tax or conservative advocacy group; the Urban Institute was created under the Johnson administration during the Great Society era, and it receives most of its funding from the federal government. By historic standards, today's situation is an aberration. Between 1950 and 1990, the number of owe-no-money federal tax returns averaged 21 percent, dipping to 18 percent in 1986, according to Tax Foundation data. In the 1990s, the owe-no-money percentage hovered around 25 percent of taxpayers. But then politicians began another round of tinkering with the tax code, adding reams of new pages to an already incomprehensible set of rules that even the guy overseeing the IRS can't seem to figure out. Democrats wanted to lower taxes on the least affluent, while Republicans wanted to lower taxes on everyone. The result was bipartisan enthusiasm for tax credits aimed at everything from children (1997) and college students (1997) to hybrid cars (2005) and homebuyers (2009). Many of these credits dole out cash to people even if they report no income, making them mere government handouts. "There's no difference at all in terms of the effects on the federal deficit," says Williams of the Tax Policy Center. "It's perfectly equivalent. It's just easier to say, 'I cut your taxes' as opposed to 'I created a new federal program to send money to people.'" I'm talking here about federal income taxes, not other taxes like Social Security, Medicare, state income taxes, sales taxes, or car registration taxes, some of which are extracted through payroll deductions. The owe-no-money crowd tends to get hit by at least some of those. The perils of today's situation should be obvious. The United States is close to a tipping point - where most people can skip the post office run on April 15 to mail a check because they're expecting one from the government instead. 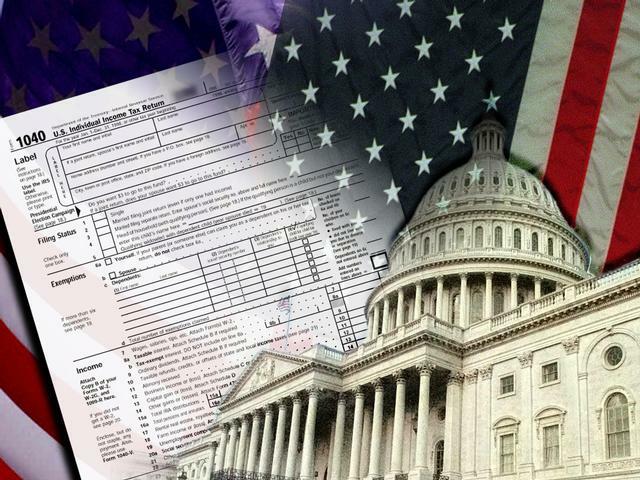 "It is somewhat odd that you have a decreasing number of folks paying into the federal income tax system, a decreasing number of folks who have a stake in what the government pays for," says Matt Moon of the non-partisan Tax Foundation in Washington, D.C. It then becomes tempting to vote for politicians promising more and more handouts, paid for by money forcibly extracted from an ever-shrinking number of their neighbors. In addition to being immoral, it's poor public policy: people who pay no taxes but nevertheless get benefits are less likely to be careful overseers of their elected representatives. "At some point people become less and less invested in making sure their government is accountable and frugal," says Peter Sepp, vice president for policy and communications at the National Taxpayers Union, a lower-tax advocacy group. "If you pay very little for getting all kinds of government benefits, you might view those programs as a bargain, even though they may waste tens of billions of dollars a year." As a candidate, President Obama promised still more tax credits, including ones aimed at child care, "clean cars," and savings accounts. As the Wall Street Journal explained at the time: "You can receive these checks even if you have no income-tax liability. In other words, they are an income transfer - a federal check - from taxpayers to nontaxpayers. Once upon a time we called this 'welfare,' or in George McGovern's 1972 campaign a 'Demogrant.'" A recession, the stimulus, and innumerable bailouts have placed Mr. Obama's plans on hold. But the expiration of the Bush tax cuts at midnight on December 31, 2010 will renew interest in a tax law rewrite. That will be an opportunity to gut the current system and replace it with something simpler and fairer. After all, if government is important enough to force most of us to work until April 13 to pay its bills, why shouldn't everyone share the pain? I encourage you to bookmark the home page for my Other People's Money column. An RSS feed is available too. If you have questions, feedback, or suggestions, please feel free to e-mail me at declan.mccullagh@cnet.com. Declan McCullagh is the chief political correspondent for CNET and a CBS News EconWatch contributor. Previously, he was Wired's Washington bureau chief and a reporter for Time.com and Time magazine in Washington, D.C. He has taught journalism, public policy, and First Amendment law. He is an occasional programmer, avid analog and digital photographer, and lives with his wife in the San Francisco Bay area.